One of the brands that are known for their range of audio products is Creative. They’ve been creating external devices and sound cards for over a decade. 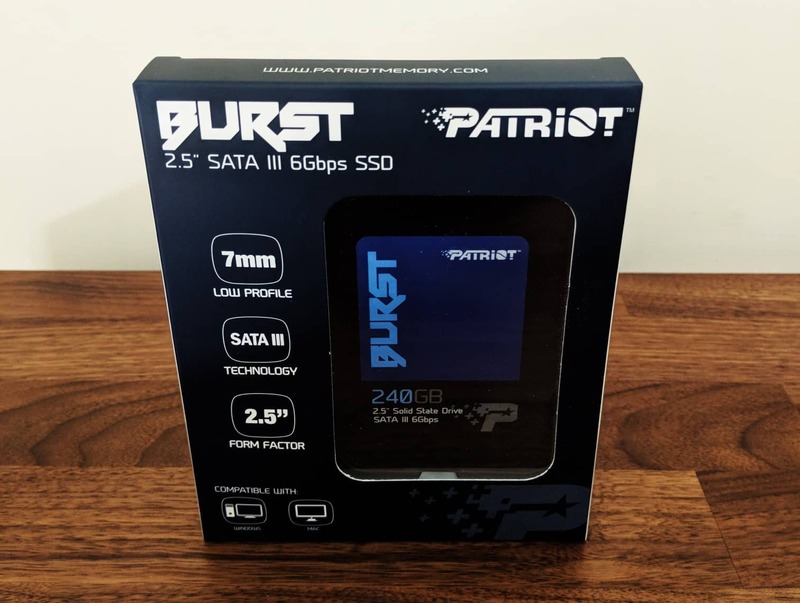 Their latest offering in their series of Sound BlasterX products is the Sound BlasterX G6, which replaces their G5 which was well-received by their fans. Essentially, the Sound BlasterX G6 is a DAC or Digital to Analog converter plus amplifier that is packed in a single unit. Today, we’re looking at their portable sound card that can be moved from your PC to any console of choice. This is while giving you surround sound, high-res audio, as well as audio enhancing amplification & effects for even the most demanding music enthusiasts. Now is it something really worth investing in? Are its features and its performance all up to your needs and requisites? Let’s go ahead and check it out. Creative Sound BlasterX G6 Review – What’s in the Box? The Creative Sound BlasterX G6 has a pretty nice looking box that sports a red and black theme. It features an image of the device that’s on the front of the package, and is surrounding by a couple of brandings, primary features, as well as a quick list of all compatible platforms that work with the G6. When looking at the rear portion of the box, you will see a display of some G6 diagrams, as well as a couple of connection types that can be used to link to the G6. You’ll also find other detailed specifications and a list of all the requirements for your PC. Together with the Sound BlasterX G6, you will find other accessories in the package such as the user guide, a micro USB cable, some documentation, and a TOSLINK cable. If you take a look at the Sound BlasterX G6, you’ll see that it didn’t really go through a lot of changes when compared to the previous model; but of course, Creative did make a couple of vital changes and minor visual upgrades to the device’s finish. This is specifically on its body and the right-hand portion of it. However, when you look at its overall style and form factor, these still appear quite similar to the G5. The Sound BlasterX G6 is only slightly bigger than your deck of cards, so you won’t need to make a lot of space for it; of course, you just need to remember that cables are required to be plugged from the two ends. Yet since the device is small, you also won’t need to worry much about clutter when using the Sound BlasterX G6. Now for the front part of the device, it features a prominent and centralized volume dial that has a nice white glow to it. To its left, you’ll find the headphone output while on its right, you’ll find the 3.5 millimeter output for the microphones. When taking a look at the right-hand side, there are a collection of LED indicators and buttons; the latter is utilized for activating the various effects, plus an additional switch is also present to alter the gain. As for the LED indicators, these are necessary for letting you know which of the profiles the amp is currently in; the available modes include Dolby, microphone, and headphone. When taking a look at the left portion of the Sound BlasterX G6, it’s clear and clean of any buttons or ports, yet it does feature the model number, and all the confirmation marks that allow the G6 to be sold all over the world. At the device’s rear end, you will see a micro USB port which has an optical in and out. The previous generation’s model had a full-sized USB port, yet the company decided to omit that specific feature on this latest model. The top portion comes with a very attractive and nicely-brushed metallic section right at the center. It features the Sound Blaster branding, as well as a customizable X logo. Since it’s RGB, it can be modified via the software. Now under the Sound BlasterX G6, it is entirely covered with a rubberized material. This does not only provide the G6 with a bit of extra grip, but it also gives you a layer of isolation from vibrations which is really good. The primary advantage of devices such as the Sound BlasterX G6 is the compatibility that it has on both ends. The console or PC side is one thing, but the idea that any type of headphones can work on the other contradicts the need to purchase a dedicated gaming headset. We like how the Sound BlasterX G6 works, and it individually amplifies the left and right channels by utilizing discrete elements to enhance, as well as to clarify output for audio. When you’re looking at the standard headphone amps, these do both channels simultaneously. This is alright for music but it isn’t really ideal for gaming which has separate signals going to each ear. The Sound BlasterX G6 from Creative occasionally needs a power source, and goes through the micro USB port on one of the ends. An optical output and input is positioned on one side, while the microphone and headphone jack can be found on the other, flanking the volume’s knob. Along one of the edges is the direct / scout mode button, the headphone’s LEDs for the headphones’ output / input indicator, the device’s gain switch, and the SBX button. The Sound BlasterX G6’s specifications are highly impressive: it provides you with an ultra-dynamic range of 130dB, and it is also a high-res gaming DAC amp, plus USB sound card-capable of 32-bit / 384kHz DoP and PCM playback. The extremely low 1 Ohm impedance for its output excellently drives the sensitive and performance-grade 16 Ohm monitors. This goes all the way to the 600 Ohm professional gaming headsets and regular headsets. The Sound BlasterX G6 comes with the Dolby Digital decoding, sidetone speaker volume controls, 7.1 virtual surround sounds, and the legacy of Sound Blaster’s outstanding sound boosting technology. This USB sound card is compatible with PCs and consoles such as the PS4, Nintendo Switch, and the Xbox One. It combines the USB DAC or Digital Audio Converter with Creative’s Xamp headphone amplifier to give you incredible and detailed sounds. The Sound BlasterX G6 offers the ultimate audio performance of any gaming DAC or USB sound card in the market. When paired with a good headset, the sound card makes audio from games more realistic since it delivers additional details that you’ve never heard before. The Sound BlasterX G6 supports 7.1 virtual Dolby Digital decoding to accurately reproduce details in-game audio such as gunshots and your opponents’ footsteps. The great thing about this is that it doesn’t only enhance your game audio, but it makes music sound great as well. The Sound BlasterX was made to meet the standards of the most discerning audiophiles and gamers. It is built with the best components to offer the perfect sound quality. Activating Scout Mode makes you advantageous in gaming. This technology has been tested to enhance important audio cues in video games including sounds of weapons being switched, footsteps, and more. This allows you to easily find your opponents’ location before they even find you. Whether you play all your games on a PC or console, the Sound BlasterX G6 has all the connectivity options you’ll ever need – USB, optical and in-line. With that, the Sound BlasterX G6 wi your gaming audio, no matter what device you use. Creative Sound Blaster has been audio processing since the past thirty years which is why the company’s sound cards deliver the best. You even have control of every single thing via its software, Sound Blaster Connect. The Sound BlasterX G6 is built for ease of use. It has a single audio wheel so you can control both in-game audio and the volume of your mic to easily balance the sounds. The side buttons let you manage the Scout Mode and processing profiles. The switching between speakers and headphones is made easier through the Sound Blaster Connect. The jewel in the Sound BlasterX G6 is the exclusively designed Xamp amplifier for headphones. Unlike other gaming DAC amps that use single amplification, Xamp allows for individually amplifying both audio channels. This lets you enhance audio on bass, highs, and mids. Setting up the Sound BlasterX G6 is really easy and you don’t need to be an audiophile to get things up and running. We were quite impressed that there were no calibrations required and the entire installation process only took a short time to finish. We first tried setting this up on our PS4. Here, we linked the optical cable on one of the front USB ports and to one port located at the back. We used our Sennheiser headphones to plug into the console, and once we got the PS4 running, the audio came through automatically. Now on the PC, it’s a bit different due to the Sound Blaster Connect desktop application. This offers better customization, and we really wish that some of the settings for the PC is also available for the console. Thing is, since the Sound BlasterX G6 isn’t equipped with an internal memory to store such settings, we didn’t get to copy any of the available custom features when we played on the console. Since the company designed the cable’s layout for distances of desktops, specifically those you’d often see in eSport setups, we greatly advise that you choose a headphone cable extension when using the device in your living room. Let’s talk about the performance of the Sound BlasterX G6. When we tried it out, the first thing that we noticed was the instant audio enhancement; which was all thanks to Creative’s technology called the Scout Mode that boosts the ambient noise. This didn’t only add up to the character of the games we tested, but it also aided in discovering a course of action. Voices or footsteps could be heard clearer, louder, and enhanced which offered a tactical advantage especially when we were hiding or moving. This also becomes highly advantageous when we had to ambush some enemies. Another great thing is that all these were possible without us having to crank up the volume and that’s really awesome. If we wanted to, we could have easily enhanced things by switching the gain to high which boosts audio going through our headphones. We tried switching on the SBX mode and it only fascinated us even more. We felt like we had a surround-sound system right between our ears. The mode didn’t only amplify the audio further, but it also added to the spatial audio improvements via algorithms to prompt a wider soundstage. There’s a ton of technical things happening to achieve the perfection of the Sound BlasterX G6, but all of this is virtualized. Remember that you can’t really completely imitate how your multiple, physical speakers work in a room. Instead, Creative attempted to stimulate this experience, and the results were undeniably good. During gaming, we didn’t only hear voices, footsteps, gunshots, and other sounds, but we were also able to determine where all these sounds came from and that’s highly exceptional. To be fair during our tests, we tried out a couple of different headphones to see any of the differences between them. We concluded that quality helps in getting more from the audio’s amplification. That is just like stating the obvious, but the really good thing here is that even your old gaming headphones will sound crisp, clear, and new which is all thanks to the awesome sound card from Creative. All in all, we’re giving the Sound BlasterX G6 two thumbs-up for its outstanding performance. The Sound Blaster Connect by Creative is made to work with the company’s products under Sound Blaster. It offers full control on a number of various settings such as audio, voice, and lighting of your linked devices. For the mic settings, you will be accessing the setup menu and click on the gear icon next to the mic. This can be found under the recording section. With just one press of a button, a customizable preset of the effects for voice, audio, and lighting can be set to instantly improves the quality of your audio. The best part is that even if you’re not familiar with the things on the specification list, you can rely on your hearing. Your audio can be richer, fuller, and more detailed without having to compromise on the surround sound. To make things short, the G6 will really make your gaming experience more realistic and immersive through audio. When it comes to the Crystalizer, this crystalizes the layers of sounds as it hits your ears to make the audio sound clearer. However, you have to remember not to overdo it since cranking any effect as high as it can go can ruin the quality of your audio. The Dolby Digital Decoder is one of the new additional features in the Sound BlasterX G6. This is the feature that we really appreciate since it greatly improves our audio. The included surround sound is also very good and gives you a fully immersive experience. All in all, the Creative Sound BlasterX G6 provides high-quality sounds that are improved with the SBX. This DAC / Amp will improve the sound of your headset. If you rely on your motherboard’s audio processing, and own a console that you’d want to hook up, the Creative Sound BlasterX G6 is for you. Additional benefits that you get with this sound card include using an amplifier unit and one DAC for multiple inputs. This allows you to instantly switch between these and use your favorite headphones. 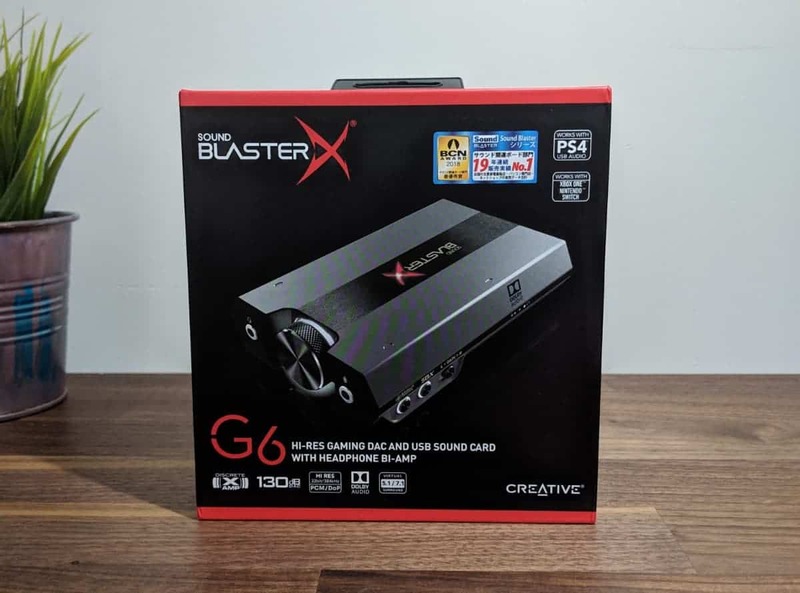 You can pick up the Creative Sound BlasterX G6 for around $149USD from over at the official product page.